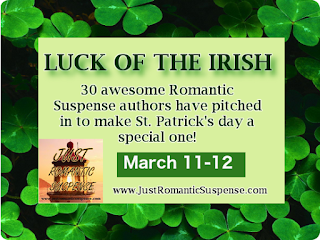 NANCY C. WEEKS - ROMANTIC SUSPENSE AUTHOR: JRS LUCK OF THE IRISH GIVEAWAY!! My new release, The Eyewitness is in it's first GIVEAWAY --- ONLY MARCH 11-12. Here is what you need to know. This giveaway is now running live on the www.JustRomanticSuspense.com home page, where you can leave a comment! Good luck in the giveaway! On March 13th, one grand prize winner will be able to select 10 titles of their choice from the Pot Of Gold. To enter, simply stop by and share your favorite good luck charm, ritual, or superstition.